Will Strong Economy Sway US Voters at the Polls? Will Strong Economy Sway Voters in November Midterms? WATCH: Will Strong Economy Sway Voters in November Midterms? Throughout West Acres, North Dakota's largest shopping mall in Fargo, help wanted signs fill storefront windows. "It's a very competitive market," said Brad Ruhro, owner of Legacy Toys, a family-owned chain of toys stores with a location at West Acres. Ruhro said that as a toy store owner, it's easy for him to tell when the economy is perking up. "We're seeing a continual uptick in customers," he said. "When the economy's not so great, they're buying the necessities -- food, supplies that they need to survive. When the economy's doing better, they're able to spend more on entertainment and fun." North Dakota has been one of the biggest beneficiaries of the country's economic growth. Unemployment in the state is a mere 2.6 percent -- tied with Iowa for the second lowest in the country, after Hawaii with 2.1 percent. North Dakota residents have received the highest average tax cut of any state in the nation -- 10.8 percent or $2,170 a year. A Gallup poll released in early 2018 showed that North Dakota residents tied for first with Wyoming residents for economic confidence scores throughout 2017. But the realities of economic challenges can complicate voter decisions at the ballot box. Shopping at West Acres Mall with his wife and daughter for what he described as "just the basics," Michael Norby said he didn't vote for a Democrat or a Republican in the 2016 election. A college student and a full-time warehouse worker at the local Pepsi factory, Norby said he is the kind of voter who makes decisions on candidates based on how he thinks they can benefit him on income taxes and minimum wage. "I don't feel it's going up fast enough for people to go out and spend, spend, spend," he said of the economy. Norby did not vote for Democratic Sen. Heidi Heitkamp in 2012 but said he is considering her this time around. Heitkamp and her opponent, Republican Rep. Kevin Cramer, are locked in one of the tightest Senate races in the country. Trump carried North Dakota by 36 percentage points over Democrat Hillary Clinton in 2016 and has endorsed Cramer over Heitkamp. Democratic Sen. Heidi Heitkamp of North Dakota, left, in white, spoke recently to Valley City farmers and small-business owners at an economic roundtable. Brad Ross, a laid-off truck driver, felt differently about the economy than Norby, even though he is paying his bills by taking temporary cleaning and office jobs. Ross didn't vote in the 2016 presidential election, but he likes the way Trump is handling the economy so much that he said he would vote for him now. "I think he's taken some pretty good strides in straightening things out, like bringing our jobs back here where they belong," he said. Despite his admiration for Trump, Ross said that he will vote to re-elect Heitkamp to the Senate because she is "tough." Throughout the country, congressional Republicans like Cramer are attempting to succeed at the polls on Trump's promise to build a strong economy, pursue an America-first approach to jobs, and spur economic growth with the 2017 Tax Cut and Jobs Act. Record stock market surges and a four-year high growth rate of 4.2 percent reinforce the president's case that the U.S. economy is surging. "We're the optimists in this country," Cramer told a group of campaign volunteers marching in a parade in this tiny North Dakota town late last month. "We're the people that see America as a land of opportunity," he said. "Not the land of doom and gloom." Yet that's a message Democrats are attempting to counter in a bid to win control of the House of Representatives and maybe even the Senate in the looming midterm elections.They argue that the economic growth fueled by the tax cuts has largely favored corporations and wealthier Americans, while providing lower- and middle-class voters with little in additional take-home pay or savings. Moreover, the Republicans' message of economic prosperity is getting lost in the controversy over Trump's immigration and trade policies, his legal woes and media reports of chaos in the White House. Heitkamp told VOA that positive, large-scale economic numbers should be celebrated. "But if you get down into the weeds and look at county by county, state by state, the numbers can be quite different," she said. Larger-scale economic gains can be difficult for many voters to feel in their daily lives as they look for ways to stretch their paychecks to cover rising living costs. Inflation-adjusted wages remain flat or slightly lower than a year ago, according to some analyses. That leaves diminished purchasing power to pay the rent or mortgage, put food on the table, and cover rising health care costs. Voters heading to the polls this November will have to decide which party's take on the economy best describes the state of their pocketbook. In rural North Dakota, where the economy is dependent on farming, Trump's tariffs on economic competitors could play a large role in voters' decisions. Earlier this year, China imposed retaliatory tariffs on a range of American farm products as part of an escalating trade war begun by Trump in an attempt to gain U.S. access to Chinese markets and change unfavorable Chinese intellectual property laws. The soybean harvest in North Dakota falls just a few weeks before the Nov. 6 elections. If Trump's negotiations with trading partners don't come through in time and prevent North Dakota farmers from shipping their crops to their usual trading partner, China, votes could shift away from Republicans. 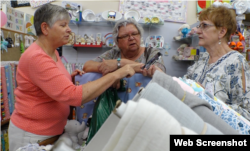 Mary Lee Nielson, shown here helping customers at her business, the Quilted Ceiling in Valley City, North Dakota, is also co-owner of a family farm. "This whole tariff situation. It's a very scary situation right now," said Mary Lee Nielson, owner of the Quilted Ceiling, a craft store in Valley City, North Dakota. "I can see where a lot of farmers don't want to spend their money." Nielson said the store has had steady business in the 14 years she has owned it with her husband. She says farm families from all over North Dakota visit her store in Valley City, a town of about 6,500 people. Nielson, a mother of three, also co-owns a farm. She said her family would take a double hit unless there is a resolution to Trump's showdown with trading partners that include China and Canada. "Back off on tariffs," Nielson said of what she wants to see next from Trump. "Don't hold farmers hostage over something that's not a farming problem." Nielson said Heitkamp's support for farming communities had earned her vote in the upcoming election. 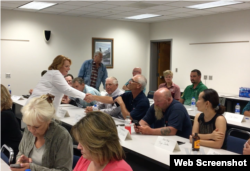 "We have an economy in this country where the urban depends on the rural economy," Heitkamp told Nielson and other Valley City farmers and small-business owners at an economic roundtable. North Dakota Republican Rep. Kevin Cramer, right, is locked in one of the tightest Senate races in the country, with sitting Sen. Heidi Heitkamp. Cramer told VOA he hears farmers' concerns about tariffs and has reminded them the president is negotiating better deals. "What I tell them is, good news is coming," Cramer said. "We push the administration on a regular basis. The president himself said to me, 'If you push for a fast solution, it'll be good, but it won't be as good as it could be.' "
Concerns about tariffs are just one part of the bigger economic picture, Cramer said, adding the need to fill 30,000 job openings in the state is "stark" while pointing to the popularity of the 2017 tax cuts bill with voters. "The $1 trillion tax cut that was passed was huge in this area," Stan Stein, a Cramer supporter and former North Dakota state Republican chairman, said. "I think it was probably $1,500 to $2,000 in everyone's pocket in North Dakota on average." The bill also has a ripple effect, said Kevin Black, president of Creedence Energy, a family-owned chemical, gas and oil company. "More people eager to invest in this industry and our area and as a result we see a multiplier force across the economy," Black said. But nationwide, only 16 percent of voters said they strongly support the tax plan, according to a June 2018 Economist/YouGov poll. That could be due in part to the small impact on paychecks, Brookings Institution economic analyst Vanessa Williamson said. "At the very bottom level, this tax cut will not have changed your income much at all," Williamson said. "Even at the middle level, maybe making $60,000 a year, you're maybe seeing an extra $20 a week and it just declines from there. So for most Americans it would be very difficult to see." Back in Kindred, voter Brady Mitchell watched Cramer march in the parade but wasn't swayed by his economic arguments. Mitchell voted for Heitkamp last time around and said he was still deciding how to vote this time. "It all goes to day care or mortgage or out the window anyway," he said of his family's economic situation. "So no, I haven't seen enough of a difference."